Purdue picks developer for $1.2B west campus – Greenstreet Ltd.
As Purdue University interviewed potential master planners for a live-work-play, community-within-a-community concept for west campus, bidders at the Indianapolis-based Browning Investments LLC set out to find similar plans for reference. They found university-driven developments of 20 acres and ones valued in the millions of dollars. But the sheer size and scope of the self-contained campus community Purdue had in mind – 450 acres and dreams of $1.2 billion in private investment – stumped them. On Monday, Purdue Research Foundation hired Browning to lead development over the next 15 to 20 years of what’s known as the Purdue Innovation District, a stretch of west campus from the antiquated apartments of Purdue Village – once known as Married Student Housing – to Purdue’s new aerospace district west of the new U.S. 231. The plan calls for a mix of housing, commercial, entertainment and industrial developments. It was prompted in large part by the three-year, $120 million State Street Project, a collaboration between Purdue and West Lafayette meant to calm traffic through campus and encourage investment in West Lafayette. Purdue President Mitch Daniels has promoted Purdue’s role with State Street and west campus designs as quality-of-life initiatives that will make Purdue more competitive in the academic market. Once those are done, Edelman said, Browning will be expected to recruit developers to build on land owned and leased by Purdue Research Foundation. Details of the contract weren’t released, but Edelman said the arrangement was built on incentives, rather than upfront fees, and designed to get work started quickly. Purdue has reason to get development going. 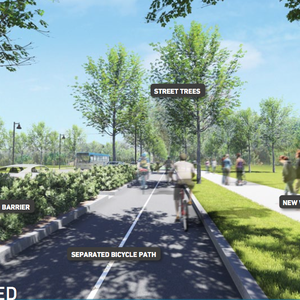 New tax revenue generated over the next 22 years in the Innovation District has been designated to pay the $60 million stake Purdue fronted for its share of the State Street project. • A privately developed university housing project with 800 beds and geared for graduate students and upperclassmen would coincided with the eventual farewell to Purdue Village. Edelman said that could be ready for students in fall 2018. • The second would address Daniels’ frequent call for a hotel and convention center somewhere near the corner of State Street and Airport Road. 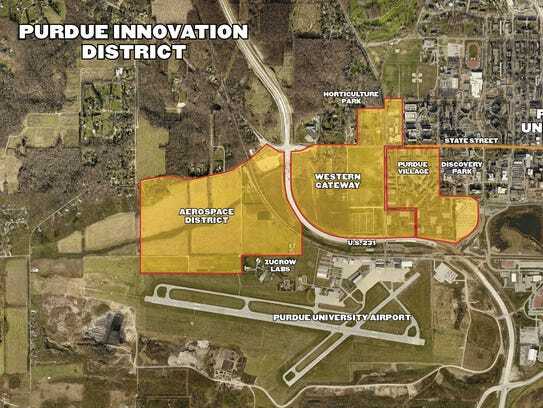 • Purdue wants to build what Edelman called an innovation hub, which would put the various pieces of Purdue’s innovation-to-commercialization programs under the same roof, along with leased space for venture capital firms. He called it “the front door to the university” for those looking to invest in Purdue intellectual property. The district includes 190 acres east of U.S. 231 and north of the Purdue Airport. The rest of the 450 acres is west of U.S. 231 and is part of what Purdue has designated as the aerospace district, being set aside for business and research that could take advantage of access to the airport. 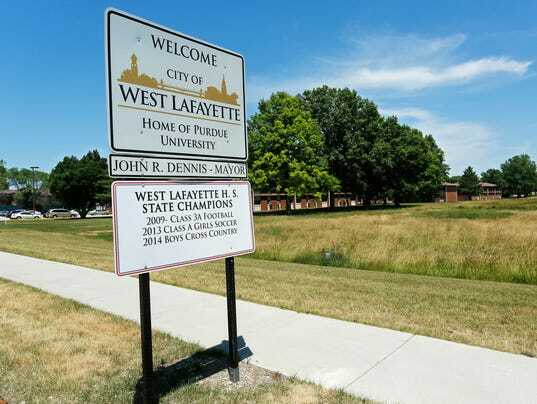 The land is part of what West Lafayette took in when the city annexed Purdue two years ago. What would Mayor John Dennis want to see out of west campus? He talked about new housing options and potential industry. More than that, Dennis said, he pinned hopes on keeping Purdue students in West Lafayette once they graduated. “When you’ve got employment opportunities, when you’re looking at some creative businesses that are going to be out there, research opportunities out there, that’s what turns a basic college town into a college town that can be emulated around the world,” Dennis said. This isn’t Browning Investment’s first public-private arrangement with Purdue. Browning helped develop Seng-Liang Wang Hall, a mix of engineering classrooms, university offices and retail space. Wang Hall proved controversial in the design stages – residents next door in New Chauncey neighborhood balked at parking concerns, the scope of the project and Purdue’s stepping closer to the historic neighborhood. There also were some hard feelings about the end product. By the time it was done, Purdue kept a larger portion of the building for university use, reducing the amount of retail space – and the amount of city tax revenues. Dennis didn’t pin concerns about Wang Hall on Browning. (“I think the issue with Wang Hall was very local,” Dennis said.) He said he was comfortable that Browning had the right kind of experience for this project.